Previous plans to build tolled managed lanes have been dropped. New non-tolled plans are forthcoming and this page will be updated when those plans are available. General information about the past and current plans is presented here. Below is information about the history of previous plans to add managed lanes to I-35 and what is currently known about the forthcoming toll-free expansion plans. In 1996, a Major Investment Study of the I-35 northeast corridor recommended barrier-separated express lanes, truck lanes, and/or HOV lanes. However, acute funding shortages in the early 2000s caused this plan to be shelved. In 2009, the Alamo Area Regional Mobility Authority (ARMA) resurrected the plan as a secondary phase for a local tollway system. Under this plan, the new lanes would be built as tolled managed lanes. As the plan was further fleshed-out, it was determined that the new lanes would need to be elevated along most of the route from downtown to the FM 1103 area. The environmental study for this project was completed in 2015. Around that time, tolling became deprecated both locally and statewide as the legislature and citizens approved new funding sources for highways. As a result, the various local planned toll projects were successively "de-tolled" as new funding sources were identified for them. The I-35 project was changed in June 2018. A managed lane is a lane where the operational strategies of the lane are adjusted in real-time as required to ensure that the lane remains free-flowing, thus providing for a guaranteed travel time for users of the lane. For example, toll rates or vehicle occupancy requirements may fluctuate based on traffic conditions or time of day. Typically, managed lanes allow toll-free access for buses, carpools, and emergency vehicles while single-occupancy vehicles (i.e. solo drivers) can use the lane by paying a variable-rate toll. How is this beneficial? Besides providing a clear way for public transportation and emergency vehicles, it also gives commuters who want or need to get where they're going faster an opportunity to bypass congestion by paying a toll to use any excess capacity of the lane. Every motorist who opts to do so removes one more vehicle from the toll-free lanes which can help ease congestion. The resulting toll revenue helps to subsidize for the road, saving scarce tax dollars for other needed projects. With the toll component removed, TxDOT is now planning to expand I-35 by adding two general-purpose express lanes plus one HOV lane in each direction. With this project in particular, the HOV lane is anticipated to also be used in the future as a dedicated lane for autonomous vehicles. Current funding projections will require the project to be divided into multiple phases. 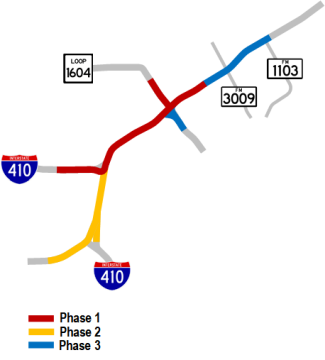 The first phase will likely run from Loop 410 North to FM 3009 and include elevated connectors at Loop 1604. It is funded and could start work as early as 2020. The remaining segments-- from downtown to Loop 410 and from FM 3009 to FM 1103-- are currently unfunded.